Obama's cell phone records were breached. (CNN) - Verizon Wireless has fired employees connected with a breach of records from a cell phone used earlier this year by President-elect Barack Obama, a Verizon source told CNN Friday. The source would not say how many people were terminated, but said that "we now consider this matter closed." The fired employees were hired "to take care of customers," the Verizon source told CNN, and were not authorized to access customer records unless asked to do so by the customer. The source also said the employees in question could not have read text messages, if Obama sent or received them, and would not have been able to access the content of any voicemail messages, although they would have been able to see if any had been left. Ari Schwartz of the Center for Democracy and Technology said the employees likely had access to the dates and times of calls, the length of calls and the telephone numbers of those Obama spoke with. (CNN) - Two sources close to the transition say that New York Federal Reserve President Timothy Geithner is “on track” to being offered the nomination for Treasury Secretary. The announcement will happen within days, possibly Monday, potentially with another member or members of the Obama economic team as well. After dropping out of the presidential race, New Mexico Gov. 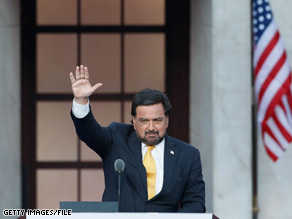 Bill Richardson, who had worked in Bill Clinton's administration, endorsed Barack Obama. 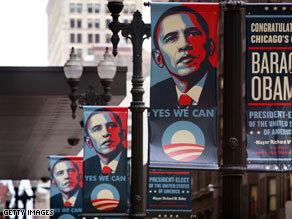 CHICAGO, Illinois (CNN) - Gov. Bill Richardson of New Mexico is a serious contender for commerce secretary in the Obama administration, two sources close to the transition said Friday. The same sources, however, cautioned that Richardson could be tapped for another senior post as well. They do not consider Richardson's appointment to the Commerce Department to be a done deal. Richardson, 61, was a candidate for the 2008 Democratic presidential nomination. Currently in his second term as New Mexico's governor, he previously served as ambassador to the United Nations and energy secretary in the Clinton administration. (CNN) - House Speaker Nancy Pelosi and Senate Majority Leader harry Reid have issued a leader to the CEO's of the big three auto companies, first obtained by CNN. The letter lists the deails of exactly what they want submitted by December 2. Cafferty: Expectations too high for Obama? 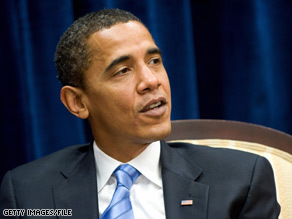 There are high hopes for big change when Barack Obama becomes President of the United States in about two months. The expectations for this man are approaching euphoria and that could be setting the stage for a big disappointment. We’ve got big problems in this country and no one is going to wave a magic wand and fix them in a matter of weeks or months. It’s likely going to take several years. Some of the president-elect’s advisers want to make sure Americans realize this and they’re speaking out. 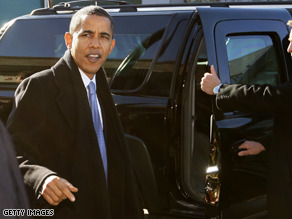 President-elect Obama is considering several people for the post of national security adviser. (CNN) – A former military man, retired Marine Gen. Jim Jones, appears to be leading the pack of likely contenders for the position of national security adviser in the incoming Obama administration. JAMES STEINBERG: Steinberg has previously served in government as a deputy national security adviser and in the State Department. RET. GEN. ANTHONY ZINNI: This Vietnam War veteran formerly headed U.S. Central Command. DR. SUSAN RICE: A veteran of the Clinton administration, Rice has worked in the State Department and the National Security Council and was a senior adviser to the Obama campaign. DENNIS ROSS: Like many of the other contenders for national security adviser, Ross served in the Clinton administration and advised the last Democratic president about the Middle East. Ross has also advised Obama about the volatile region. An interview Gov. Sarah Palin did Thursday is causing a stir. (CNN) - It’s the ultimate holiday photo-op for any governor: the yearly pardoning of a turkey to spare it from demise days before Thanksgiving. But former Republican VP candidate Sarah Palin is causing a stir for an interview she gave after pardoning an Alaska turkey Thursday, during which one bird was being slaughtered in the background. Palin appeared unaware of what was going on directly behind her, though she did seem to take a glance at the unfortunate event at one particular point during the interview. "It's nice to support a local business and just participate in something that isn't so heavy handed politics that invites criticism," Palin said during the interview. "Certainly will probably invite criticism for even doing this too, but at least it was fun." "I am always in charge of the turkey so I am where I need to be today to prepare for that," she also said. Michael Bloomberg's approval ratings have dropped since trying to change the city's mayoral term limits. (CNN) - New York City Mayor Michael Bloomberg's approval rating appears to have taken a significant hit since he successfully sought to change the city's mayoral term limits. According to a new survey from Marist College, Bloomberg's approval rating is down 9 points from a similar survey taken one month ago. The mayor still enjoys a 59 percent approval rating, though Marist reports this is the first time since 2005 it has been in the 50 percent range. "The voters don't like being defied, and Bloomberg is paying a penalty for persuading the City Council to overturn term limits that were passed twice by New York City voters," CNN Senior Political Analyst Bill Schneider said. "He has one advantage, Schneider also said. 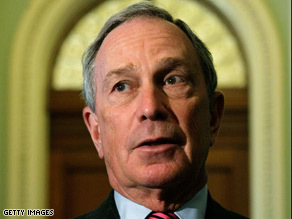 "No Democrat at this point seems strong enough to over take Bloomberg. He also has another advantage. Lots of money." Fist elected in 2001, Bloomberg cited the financial crisis for the reason he was seeking a third term. "I don't think the city needs another campaign. It's going to be tough enough to get us through this," Bloomberg told reporters last month referring to the meltdown on Wall Street. The poll was conducted from November 17-19, and carries a margin of error of plus or minus 4 percentage points. 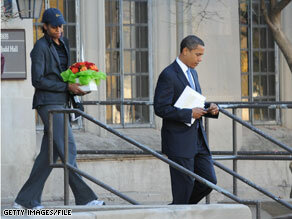 Soon after his historic White House win, President-elect Obama and his wife, Michelle, attended at parent-teacher conference at their daughters' school in Chicago. (CNN) – While a candidate, Barack Obama frequently said on the campaign trail that the federal No Child Left Behind law left the money behind. One of Obama’s first educational decisions as President-elect will be his education secretary. LINDA DARLING-HAMMOND: This professor of education at Stanford University was also an education policy adviser to Obama’s presidential campaign. JOEL KLEIN: Klein, a veteran of former President Clinton’s Justice Department and White House Counsel’s Office, is currently the Chancellor of New York City’s public school system. TOM KEAN: This Republican former governor of New Jersey was also the president of Drew University for 15 years and a member of the federal commission that investigated the September 11, 2001 terrorist attacks. ARNE DUNCAN: Duncan has local ties to Obama; he’s the CEO of the public school system in Chicago, where Obama’s political career began. CHICAGO, Illinois (CNN)– There were a couple of groups of guys in Chicago during the last seven days, all while the Barack Obama transition efforts were taking shape in a federal office building downtown. One group of guys was gathered in room 1101 in the Sofitel Hotel near Rush Street. Their names were Charles Shenk, Bob Sirkus and Michael Stern; men in their early 60s, they were in town with their wives for a wedding, but the wives had gone out to lunch and had then gone shopping, whatever shopping now constitutes in this economy. The men weren’t budging from room 1101. None of the three are political professionals, but all had been intensely, even passionately, interested in the presidential campaign; one of the men, utterly indifferent in past years to the electoral process, had surprised himself and his wife when, watching the Grant Park Election Night speech on television back in central Ohio, he began to cry because of the emotion of the historic moment. On this day, in room 1101, he looked as if he might cry again. “Don’t drop it!” he wailed as an Ohio State receiver bobbled a pass attempt. 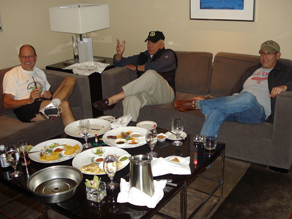 He and his two friends– along with CNN Election Express producer Josh Rubin and I– were watching the Ohio State-Illinois football game together, and every time Josh and I attempted to discuss presidential transition team developments, the men shot us looks that made us think that if they could hit a “mute” button and silence us, they would.